Burnout is common this time of year. True athletes relish the grind of the offseason, the constant physical training in the weight room, the buildup of successive practices. However, even the most focused veteran experiences burnout at one point or another. Burnout is the time period that occurs when your body or your mind hits a breaking point. Where you find yourself mentally and physically exhausted. Burnout can also carry elements of depression and cynicism, feelings of an inability to grow or improve, or the simple, yet devastating, lethargy of not wanting to do anything productive. Your motivation to be that much better can evaporate. In essence, burnout is a feeling of being done. You no longer want to climb the mountain, whilst having to push the boulder up the entire way. We can often feel like Sisyphus, with our boulder rolling back down every night. These feelings especially go hand-in-hand with the winter off-season, when it feels like we are pushing through the dark and cold endlessly. You may also feel this during your third long tournament road trip in a row, longing for a weekend on the couch instead of more playing time. The truth is that picking that boulder up and pushing it once more is exactly how we prepare for the seasons of spring and summer. Strength, fortitude, endurance, and consistency are the key for any individual or team to succeed. You need to be able to push past the burnout, or at least meet the discomfort and acknowledge it. Most of the time, this means giving yourself a break, or finding a way to reignite the energy. Other times, it means recapturing the joy of being an athlete on a competitive team. Here are seven ways to break through ultimate burnout. Monotony is the ally of burnout, while diversity is its enemy. Doing the same repetitive pattern over and over, day after day, week after week, is largely what causes the cynicism, depression, and exhaustion of this time of year. The weight lifting, skill drills, and late nights of tough practices usually occur night after night (or early morning after early morning) without the fun breaks for actual competition, which also means that there really aren’t good measurements for success. There aren’t games to be played, opponents to be bested, or often even physical ways to mark growth, especially early on when your body may still be learning new skills or movements, or building from the ground up. All pain and little sign of gain. Try switching up your training. Most athletes like set schedules and patterns, which make it easier to plan our training and complete it. These plans require less creativity, and the predictable rhythm can be helpful. But in this case, we want to invert that notion on its head. The goal is to create novelty or diversity and to make things interesting. Most often, just changing the format can make a positive difference. Switching small things like sets or rep numbers, or order of movements can be great for change. For practice, take the same advice. Run it differently than normal. Maybe feature more scrimmaging early in the day and move on from there. Perhaps do your drills in reverse order, or add small competitions into each drill set with fitness rewards. You can turn practice and drills into challenges, too. Any kind of competitive spirit, inserted into training or practice, will make things interesting. Compete against yourself or others and tap into that inner athlete again. Sometimes we just need a break from ultimate. Cross-training was created for just this kind of reason and has for many years been the solution for all types of athletes to avoid burnout. Skip the gym one day and take a fitness class, do some boxing, or go swim laps in the pool. Totally new ideas are always welcome, and while your training log might suffer a temporary break, overall your body and mind will be set up for long-term success. Gyms, workout studios, or fitness class passes and programs often offer free visits to try to entice new customers. This is prime territory for a cross-training day every few weeks or so, as you can do something totally new (and likely something you won’t do often or ever again) for free. As far as practice goes, explore ideas on totally new drills, game formats, or strategies. Invite a guest coach or athlete, or one of your own athletes, to share a new idea or to try something that they’ve done in the past, but your team has never tried. Opening it up to your own squad can build morale and help break through burnout. Ask your teammates what they’re favorite drills are and try one out, especially if it connects to your team goals and philosophy. If you’re feeling burnt out, especially physically, take a day where you do nothing athletic or sports-related. Though this can be guilt inducing at first, long-term this is best for your overall wellness. It can be fun to build these in to a training log or goal-setting sheet in advance. Putting it on paper ahead of time can ease that guilt and can make a small reward or treat for erasing burnout in an official way. Take the extra time and do something that is beneficial and productive. This could mean going grocery shopping, doing laundry, studying or doing some work, or running any other kind of errand that you normally might not have time for. Use the rest of that extra time for something relaxing. That might mean taking a long shower or bath, reading a good book, watching a movie, going to bed early, or sleeping in. These little rewards will leave you refreshed and energized for the next day. Tapering is usually reserved for the end of the season, when you finally ease off training to try and peak mentally and physically for a big competition. However, a smart athlete builds in occasional mini-tapers, or lulls, in the middle of the season for two reasons: to avoid burnout and to measure progress. Making a practice or training session slightly shorter or with lower intensity can help mentally and physically boost you. You want to walk away from these specifically saying, “Oh that was easy.” The goal is to be confident and feeling great. This can wipe away most burnout systems. A mini-taper might also be a good time to measure progress on the field. Perhaps that means setting up a scrimmage or competition against an opponent. A mid-season tournament that has important implications is another great time to do a lull, ease off training, and taper practices so that you can compete and really see how successful you can be. Tapers are useful physically and mentally. Your body and mind are less stressed because you’re simply doing less (or easier) work, and at the same time you can measure how much you’ve improved, see some good goals being reached, and feel confident moving forward. On that same note, a strong method of pushing through burnout is to remind yourself for why you’re training or practicing in the first place. A good jolt of energy can come from looking back at those goals, capturing that early season optimism or fire, and thinking ahead to your vision of success. 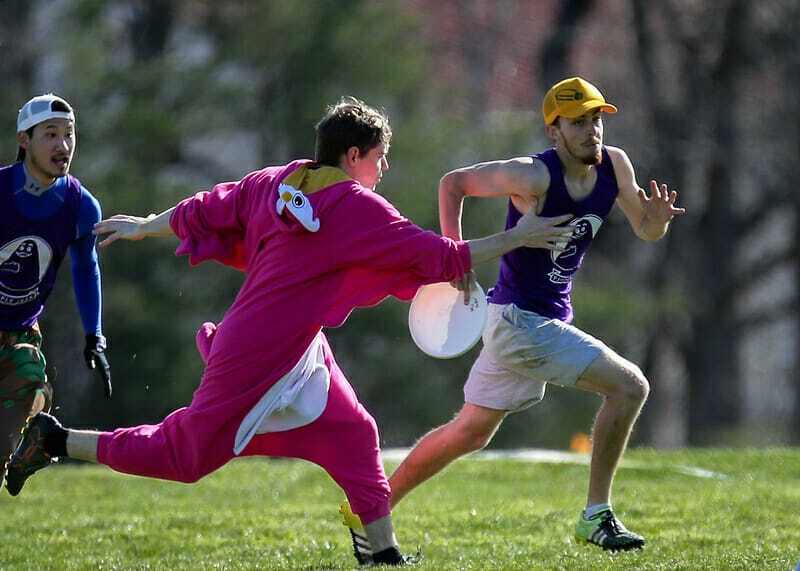 Some good ways to put yourself back into the frame of mind of the past is to watch clips of yourself playing, go over early practice plans or workout logs, or relive moments of ultimate where you felt unstoppable. Mental visualization is extremely important and taking time to think back on past success is not only a great way to build on it for the future, but this reflection also fills you with renewed desire to push forward and improve. For example, watching game tape where you dominated on defense is more likely to increase enthusiasm for the grueling person-to-person defense drills you have on the docket for the next day. Likewise, thinking back to some of your greatest moments skying opponents (or the converse) can drive you to hit the weight room and increase your muscle strength for the upcoming season. Just as looking back can help rejuvenate you, similarly so too can looking ahead to the future. These same mental visualization tools will be great for imagining yourself at the moment of success, making all the right decisions, physically feeling unstoppable, and capturing glory. These are great for team or pod sessions; reminding the group of what you hope to achieve for the season can really settle and focus everyone for the upcoming weeks of training. A two minute visualization warm up can do wonders, just as effective as a ten minute physical one. Especially focus in on what your end desire is, what the group wants to accomplish. Target those goals. If your team hopes to compete in the playoffs of the postseason with the best of the best, then think and talk about it. There’s no need to worry about arrogance or false hope; those are exactly the qualities you need in the dark times of burnout. In the depths of winter, when it’s an effort to drag yourself out of bed in the morning, let alone to the gym, think about how awesome it would be to win your conference or division. Imagine how sweet that victory would taste. And let your body be reminded of why you’re pushing so hard and what you can do. Finally, the best way to beat burnout is to have fun. Ridiculous team bonding, ultimate shenanigans, or a night out with your training partner can be the cure for any melancholy mood. Find the right moments to celebrate success and hard work; play hard on the field, but bring joy to the night after with just as much effort. Sometimes we forget to take the time to have fun. Remember, just because training is hard, doesn’t mean we can’t have the lighter moments. If you have two tough practices, a pod workout, and several days in the gym, then create your own excuse to get your teammates over on a weekend night and just mess around. Finding the fun is the ultimate way to move forward, pushing through any burnout, and leaving it in your tracks. Comments on "Tuesday Tips: 7 Ways To Break Through Burnout, Presented By Spin Ultimate"